When making an album with vocals and instrumentation, the quality of the performance is essential, along with the technical aspects like the mixing and mastering. But another important element is the song selection. And getting that right was a priority for a new Frank Sinatra Tribute CD called Some Special Favorites, by Frank Sinatra tribute performer Monty Aidem. The new release, on Vintage Hat Records, features 15 songs carefully selected to represent a cross-section of Frank Sinatra’s recordings, from different chronological periods, to different Sinatra moods, covering the swinging Count Basie sound, to the soft vocals of the Antonio Carlos Jobim/Frank Sinatra collaboration. In producing the CD, the objective was to re-create the Sinatra vocal style, complete with the Sinatra arrangements. Many of the songs included are songs that were performed in concert by F.S. like You Make Me Feel So Young, I Won’t Dance, and The Best Is Yet To Come. And some of the other selections were featured on Sinatra TV specials, like The Girl From Ipanema, Baubles, Bangles and Beads, and Love’s Been Good To Me, not to mention Paul Anka’s dramatic Let Me Try Again, performed by Mr. S. during his Madison Square Garden concert and TV special known as The Main Event. And the song was also featured on the TV special Ol’ Blue Eyes Is Back. Also included in this collection is the tribute performer’s favorite Sinatra song, a lesser-known ballad called I Had The Craziest Dream. 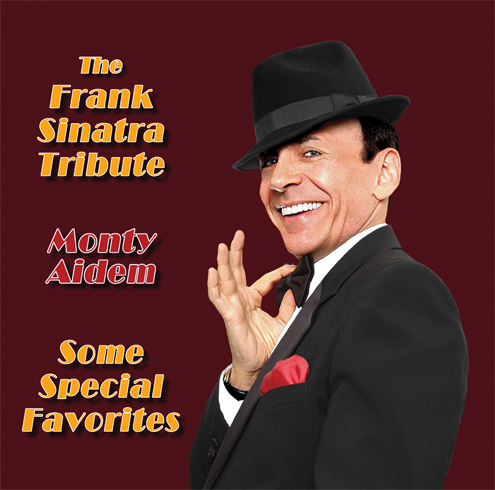 The full list of tracks, and samples of each one are available at the Frank Sinatra impersonator Monty Aidem’s website, at his Frank Sinatra Tribute CD page.